Sabre Safety has over 65 years experience in the manufacture of breathing apparatus, providing unrivalled technical support and advice. With the widest choice of airline breathing solutions, the Company's Sabre range is internationally renowned for reliability, ease of use, durability and comfort. Completely modular, Sabre Safety airline components afford almost unlimited flexibility, allowing the user to individually specify a system that exactly meets their operational needs. 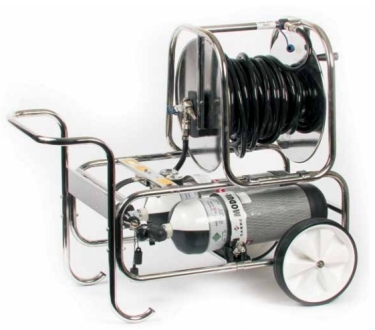 Multiple configurations can be selected from a standalone portable product - for use where no other supply of compressed air is available - to products that integrate into existing compressor-fed airline infrastructure. This solution increases freedom of movement by enabling the user to enter and egress from the working environment using a filter where there is no danger of there being an oxygen deficient atmosphere. Then, when in a working situation where the level of contaminants will be highest, connect into an airline system and work under positive pressure. RAS versions of the Promask Positive Pressure and Vision 3 facemasks are available. Self-contained breathing apparatus can also be used in conjunction with an airline by way of a simple attachment (left). This could be used to extend the working duration of the set (overcoming some of the limitations of the cylinder duration) or as a long duration escape set should the airline supply be compromised. The Cen-paq consists of a set of pneumatics mounted in a soft, comfortable jacket. Cylinder duration options of 15, 20 and 30 minutes give the user flexibility, both in terms of weight and profile of the set. The Contour range can also be used with an airline attachment. The advantage of this equipment is you can carry between 30-90 minutes of air as an escape reserve. Alternatively the airline system can be used to extend the duration of the BA set whilst the wearer is travelling to the point where he needs to disconnect and have the flexibility of an unconstrained BA set.